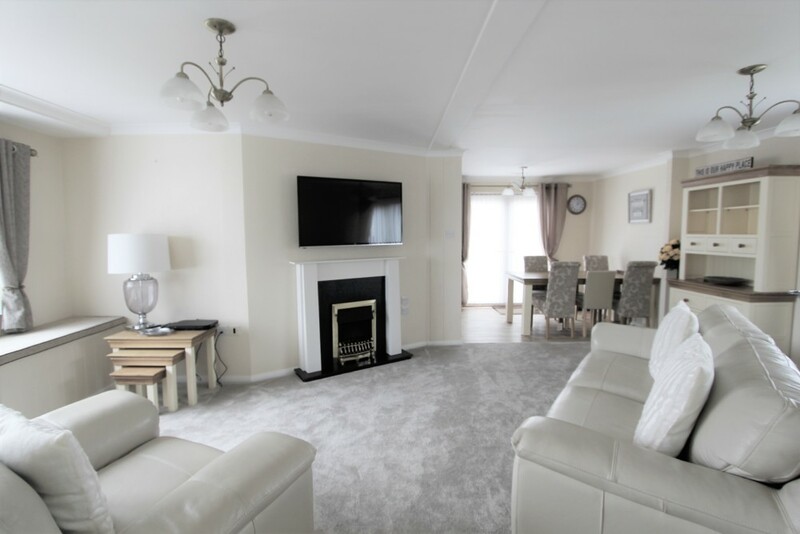 A spacious and well presented 4 Bedroom Detached Park Home having a distinctive and individual appearance and being the largest one on this exclusive development. 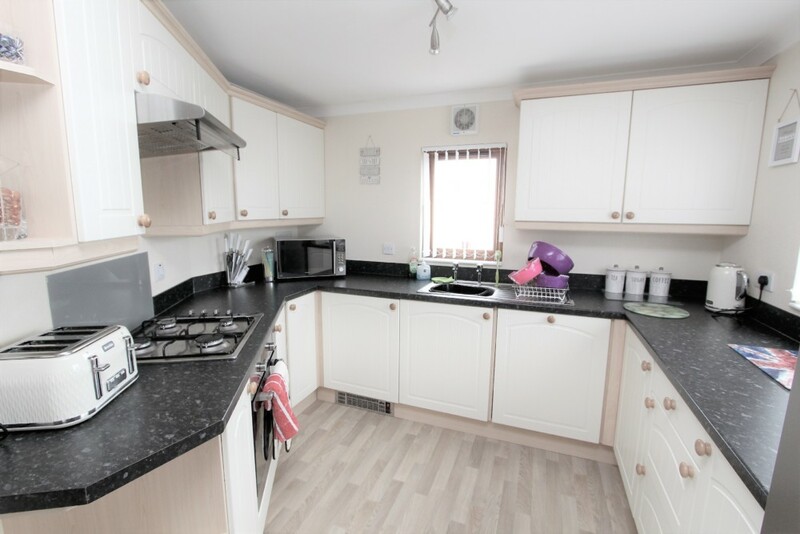 The property has Gas Central Heating, PVCu Double Glazing Off Road Parking for 2 cars, and gardens. 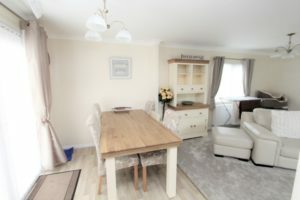 The accommodation comprises Entrance Hallway, Lounge, Dining Kitchen with integrated appliances, Utility Room, Family Bathroom, 4 Bedrooms, the Master having an en suite shower room and dressing room. Close to the Beach and Offered for Sale With No Chain. A TRUE HOME FROM HOME The stylish design of this park home makes it truly unique, with a feature bay window. Inside the home is spacious, well laid out and designed with comfort in mind. 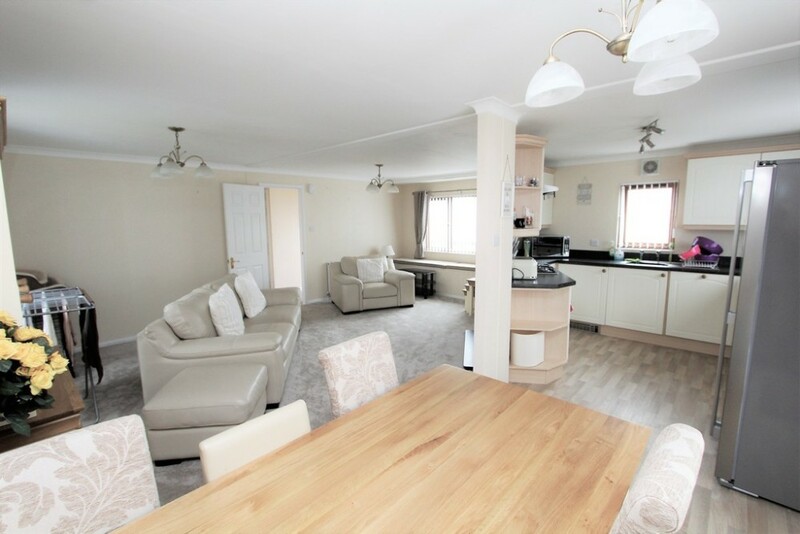 The large living area is luxuriously furnished and equipped with full central heating and modern fitted kitchen. Quite simply a home from home. 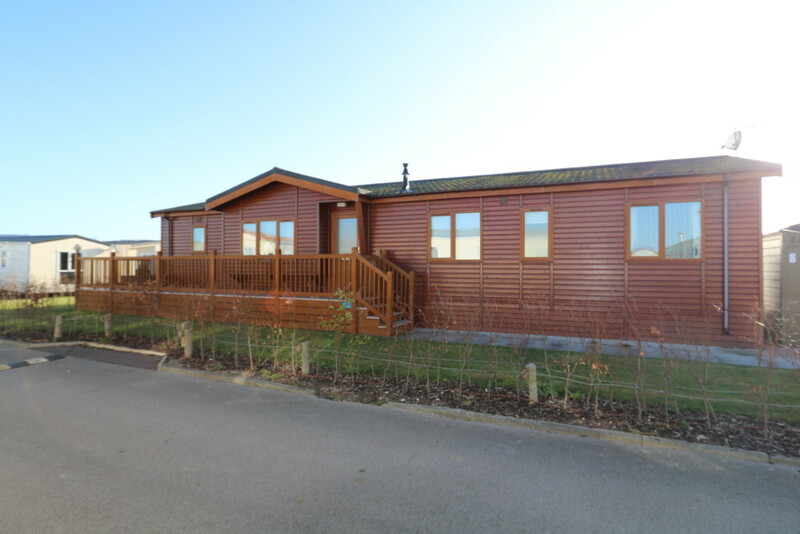 Situated on the largest plot on the development on a 12 Month Holiday Licence. The Property is 7 years old. ENTRANCE HALLWAY PVCu double glazed entrance door, Karndene flooring, radiator, coving, doors to the Lounge, Utility Room, Bedrooms and Bathroom. 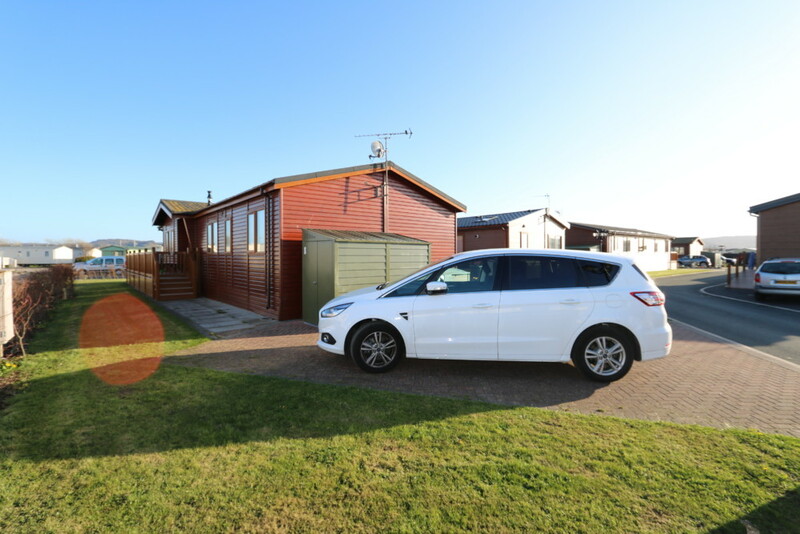 LOUNGE 19′ 3″ x 13′ 5″ (5.88m x 4.09m) Large double aspect room, radiator, coving, television and telephone point, feature fireplace with electric fire with flame effect, window seat, PVCu Double glazed windows to the front and rear, open plan to the dining area. DINING AREA 9′ 7″ x 6′ 7″ (2.94m x 2.02m) Radiator, coving, space for a dining table, PVCu double glazed french doors to the garden and decking area. UTILITY ROOM 6′ 4″ x 4′ 0″ (1.945m x 1.240m) Units to base and wall, roll edge work surface, radiator, coving, wall mounted combination boiler, space and plumbing for washing machine. 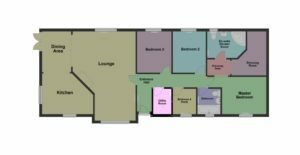 BEDROOM 1 9′ 4″ x 9′ 0″ (2.860m x 2.745m) Good sized master bedroom with dressing room and fitted dressing table, coving, radiator, television point, PVCu double glazed window to the side. EN SUITE Good sized ensuite, low level wc, vanity hand wash basin with cupboard below, large walk in shower cubicle with power shower, radiator, extractor, PVCu double glazed window to the rear. BEDROOM 2 9′ 4″ x 8′ 3″ (2.845m x 2.535m) Double room with a range of fitted wardrobes, coving, radiator, television point, PVCu double glazed window to the rear. 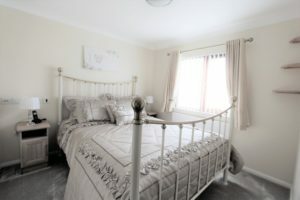 BEDROOM 3 9′ 4″ x 8′ 3″ (2.845m x 2.535m) Double room, with a fitted wardrobe, coving, radiator, television point, PVCu double glazed window to the rear. 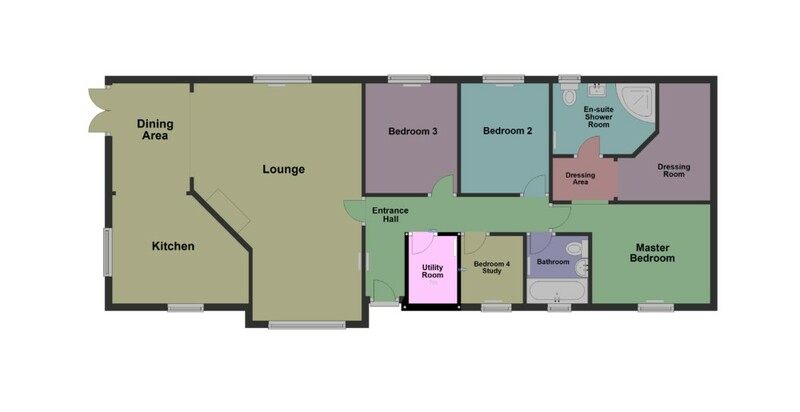 BEDROOM 4 STUDY 6′ 4″ x 5′ 7″ (1.945m x 1.715m) Single bedroom, could be used as a study, coving, radiator, television point, PVCu double glazed window to the front. OUTSIDE To the rear of the park home there is a block paved driveway providing off road parking for 2 cars, a flagged pathway leads to front garden and front door, an all weather wrap around decking area leads to the main front patio area and garden laid to lawn. NB Please note: Site Fees have been paid for this year. Site fees are payable to Whitehouse Leisure Park. 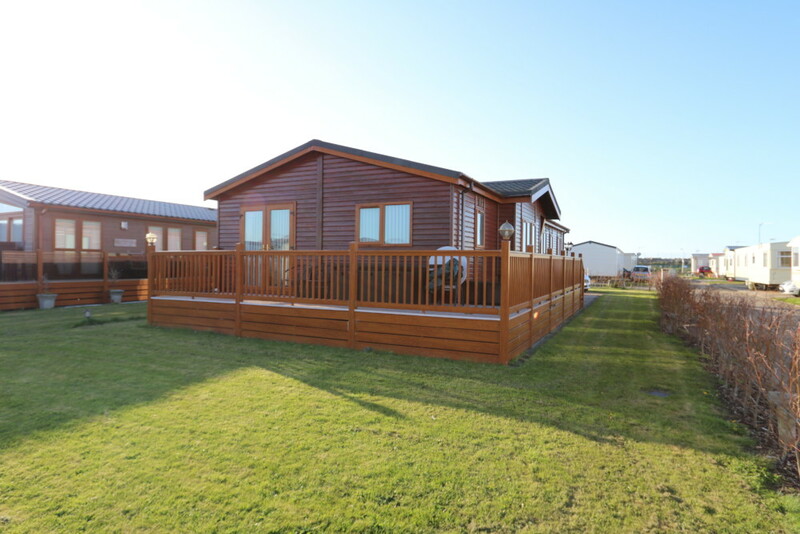 The grass is cut by the management company, the site has secure gated access with card entry. De Mere Gardens is small select development with further double wrought iron gates that lead to the Park Home. 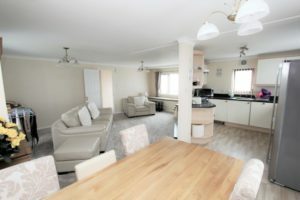 Don’t worry about having to up sticks and vacate every year as you can have residency for 12 months of the year and can be used as a holiday home and children are welcome. This really needs to be seen to be appreciated.